"It's Belgic because I'm wearing it in Belgium"
Whenever Napoleon I escapes from Elba and needs to meet his Waterloo, Mr Monkey dusts off his Belgic shako and scampers off to a field outside Brussels. As a member of the Light Company of a Foot Guards regiment he does his best to defend the farmhouse of Hougoumont against the attacks of Prince Jerome Napoleon (or, more accurately, the soldiers commanded by Jerome). The Belgic, or Waterloo, shako replaced the stovepipe shako as the standard headwear of the British infantry around 1812, though some units turned up at Waterloo wearing the older style shako. 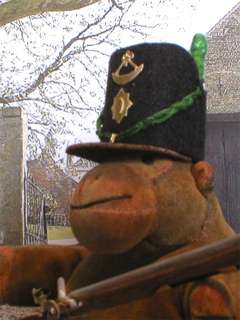 Mr Monkey's Belgic shako is mostly made from felt and card. The leather peak used to be part of one of Miss Carol's handbags, and the plume is one end of a cotton bud dabbed with a felt tip pen. The cords are made from cotton thread, held in place by plastic rivets and a bit of bent paper clip. The badges, which are more or less* accurate for a light company of the Foot Guards in 1815 according to issue 14 of Military Illustrated Past and Present, are just cut out from gold coloured card. 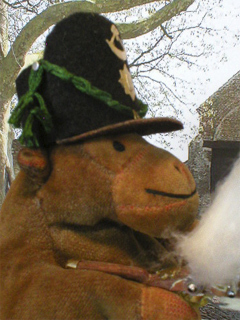 Mr Monkey's musket is made from balsa wood, with a barrel made from a biro barrel and gold and silver card fittings. The hammer and pan cover are held in place with plastic rod rivets, and the ramrod is a length of plastic rod. The sling is medical bandage paper, held on by wire catches. * The less part being that the top badge should really be a lot more like a bugle than a banana. Mr Monkey would have his banana.